Anti-cytochrome P450 (CYP)1A2 autoantibodies are found in dihydralazine-induced hepatitis, and CYPs2B and 2C have been shown to follow vesicular flow to the plasma membrane (PM). However, it is unknown whether other CYPs follow this route, whether NADPH-CYP reductase is present on the hepatocyte surface, and whether autoimmune hepatitis-inducing drugs increase PM CYPs. In this study, we determined the transmembrane topology and transport of CYPs1A in rat hepatocytes. In cultured hepatocytes, colchicine and other vesicular transport inhibitors decreased PM CYPs1A assessed by flow cytometry. Colchicine administration also decreased PM CYPs1A in vivo. Pulse chase experiments with [35S]methionine showed that only the newly synthesized CYP molecules are transferred to the PM, whereas microsomal CYP1A2 was stably radiolabeled for several hours. In contrast, radiolabeled CYP1A2 reached the PM and disappeared from the PM with half-lives of less than 30 min. Confocal microscopy, biotinylation, and coimmunoprecipitation experiments showed that PM CYPs1A and CYP reductase are present on the cell surface, and that the reductase is closely associated with PM CYPs. Exposure of whole cells to an anti-CYP1A1/2 antibody at 4°C, before five washes and PM preparation, abolished PM CYPs1A-supported monooxygenase activity, indicating that PM CYPs are mostly located on the external surface. Dihydralazine and other CYPs1A inducers increased PM CYPs1A. In conclusion, newly synthesized CYPs1A follow vesicular flow to the outside of the PM, and NADPH-CYP reductase also is located on the hepatocyte surface. Dihydralazine administration increases PM CYP1A2, its autoimmune target. Anti-cytochrome P450 (CYP) autoantibodies are found in some forms of idiopathic, virus-, or drug-induced autoimmune hepatitis (Beaune et al., 1987;Manns et al., 1989; Bourdi et al., 1990, 1996; Eliasson and Kenna, 1996). In drug-induced cases, the anti-CYP autoantibodies are selectively directed against the particular CYP isoenzyme that activates the drug into a reactive metabolite that covalently binds to the CYP protein (Robin et al., 1997). Thus, dihydralazine is transformed by CYP1A2 into reactive radicals that covalently modify the CYP1A2 protein (Bourdi et al., 1994). Sera of patients with dihydralazine-induced hepatitis contain antiliver microsome autoantibodies, which selectively recognize CYP1A2 (Bourdi et al., 1990). The presence of anti-CYP autoantibodies in autoimmune hepatitis has generated interest in the cell surface expression of CYPs. CYPs have been detected in the plasma membrane (PM) of rat and human hepatocytes and are, at least in part, located on the outside of this membrane (Satoh et al., 1987; Loeper et al., 1990, 1993). A possible experimental artifact due to the adherence of extracellular cell debris to the PM of isolated hepatocytes was ruled out by several experiments (Satoh et al., 1987; Loeper et al., 1990, 1993). After exposure of rat or human hepatocytes to diverse anti-CYP antibodies or autoantibodies (including anti-CYPs1A), electron microscopy showed continuous labeling of the PM, ruling out spotty adherence of extracellular debris (Loeper et al., 1990, 1993). Addition of liver microsomes to rat hepatocyte suspensions did not increase the staining of linear regions of the PM labeled with the anti-CYP antibody (Satoh et al., 1987). Finally, some livers were perfused in situ at 4°C with the anti-CYP antibody, washed by nonrecirculating perfusion with Krebs-Ringer for 10 min, and then fixed in situ (Loeper et al., 1993). Electron microscopy again showed linear labeling of the hepatocyte PM, confirming the presence of CYP on the outside of the PM (Loeper et al., 1993). Being present on the outside of the PM, CYPs could serve as antigenic targets for anti-CYP autoantibodies (Loeper et al., 1990, 1993). The next question was to try understand how CYP can reach the PM. CYPs are cotranslationally inserted in the endoplasmic reticulum (ER) membrane where they remain anchored by a noncleaved, signal peptide/membrane anchor sequence (Sakaguchi et al., 1987). The N-terminal methionine and a few amino acids are in the lumen, the signal/membrane anchor peptide across the membrane, and the rest of the molecule in the cytosol (De Lemos-Chiarandini et al., 1987;Vergères et al., 1991; Black et al., 1994). ER NADPH-CYP reductase (CPR) has a similar transmembrane topology (Kida et al., 1998). There is extensive flow of vesicles migrating from the ER to the Golgi apparatus and the PM along microtubules. CYPs are present in the Golgi (Neve et al., 1996) and vesicular transport inhibitors decrease PM CYP2B1/2 and CYP2C11, indicating that these CYPs follow vesicular flow to the PM (Robin et al., 1995, 1996). However, it is not known whether other CYPs follow this route, whether CYP molecules are randomly transported to the PM or only the newly synthesized molecules are transported, whether CYPs are partly or mostly located on the outside of the PM, whether autoimmune hepatitis-inducing drugs increase PM CYPs, and whether CPR is also present on the surface of hepatocytes. The aim of this study was to answer these questions in rat hepatocytes. Dihydralazine was a gift from Ciba-Geigy (Rueil-Malmaison, France). Immunoinhibitory anti-rat CPR goat serum was purchased from Interchim (Montluçon, France). Rabbit affinity-purified anti-rat CYP1A1 and anti-rat CYP1A1/2 polyclonal antibodies were obtained from XenoTech LLC (Kansas City, KS). Rat CYP1A2-expressing yeast microsomes and purified rat CYP1A1 were given by Denis Pompon (Centre de Génétique Moléculaire du Centre National de la Recherche Scientifique, Gif-sur-Yvette, France) and Philippe Beaune (Institut National de la Santé et de la Recherche Médicale U490, Paris, France). Albumin-bound peptides were prepared by Genosys (Cambridge, England). The N-terminal, premembrane peptides of CYP1A1 (MPSVYGFP) and CYP1A2 (MAFSQY; Nelson and Strobel, 1988) were bound to BSA through their C-terminal end. Male Sprague-Dawley Crl:CD(SD)BR rats from Charles River (Cléon, France) were given food and water ad libitum. Colchicine (2.5 mg/kg b.wt.) was administered i.p. 5 h before sacrifice. Some rats were treated i.p. for 3 days with 3-methylcholanthrene (20 mg/kg b.wt. daily), isosafrole (125 mg/kg b.wt. daily) or dihydralazine (150 mg/kg b.wt. daily), and sacrificed 24 h after the last dose. Other rats received cobaltous chloride (35 mg/kg s.c.) twice daily for 3 days, and were sacrificed 17 h after the last dose. Hepatocytes were isolated, plated, and cultured as previously described (Robin et al., 1995). Vesicular transport inhibitors were added after cell attachment (Robin et al., 1995). Microsomes were prepared from rat livers (Bourdi et al., 1994) or from isolated or cultured hepatocytes (Robin et al., 1995) as previously described. PMs were prepared by electrostatic attachment of isolated hepatocytes to polyacrylamide beads (Biogel P-2, fine; Bio-Rad, Richmond, CA) coated with polyethyleneimine (Loeper et al., 1990, 1993). After disruption of hepatocytes by vortex mixing, sedimentation, and several washings, PM-coated beads were obtained. PM proteins were solubilized in 3% SDS and concentrated if necessary. Microsomal contamination was determined by measuring glucose-6-phosphatase (an ER enzyme) as previously described (Loeper et al., 1993). PM activities (mean for three experiments) were 0.8% of microsomal activities in untreated rats, and 1% in 3-methylcholanthrene-treated rats. Thus, PM microsomal contamination was 1% or less. PM and microsomal proteins underwent electrophoresis on SDS-9% polyacrylamide gels, were transferred to nitrocellulose sheets, exposed to the primary antibody and peroxidase-conjugated anti-immunoglubulins, and then revealed as previously described (Robin et al., 1995). For flow cytometry, hepatocytes (5 × 105) were exposed to nonimmune rabbit immunoglobulins G (1 μg/100 μl) or the anti-CYP antibody (1 μg and 2.5 μg/100 μl of anti-1A1/2 and anti-1A1, respectively), washed, and incubated with fluorescein isothiocyanate (FITC)-labeled anti-rabbit immunoglobulins (Institut Pasteur Production, Marnes-la-Coquette, France) diluted 1:50 (v/v) in PBS. Propidium iodide (10 μg/ml) was added for 15 min to label and exclude dead cells (Robin et al., 1995). Hepatocytes were fixed with 2% paraformaldehyde and analyzed by flow cytometry (Robin et al., 1995). The logarithmic mean channel number of each histogram was converted into relative linear fluorescence intensity (Robin et al., 1995). The difference in fluorescence intensities between the anti-CYP antibody and nonimmune immunoglobulins is an index of PM-specific labeling (Robin et al., 1995). For confocal scanning microscopy, hepatocytes were exposed to nonimmune rabbit IgG or the anti-CYP1A1/2 antibody, and then to FITC-labeled anti-rabbit immunoglobulins. Other hepatocytes were exposed to control goat serum or the anti-CPR serum, and then to FITC-labeled anti-goat immunoglobulins. Cells were placed on a slide in Glycergel (Dako, Carpentaria, CA), and analyzed by confocal microscopy (Robin et al., 1995). Isolated hepatocytes were treated with sulfosuccinimidyl-2-(biotinamido)ethyl-1,3-dithiopropionate (Interchim; 1 mg for 5 × 106 cells) for 30 min at 4°C (Volz et al., 1995). This membrane-impermeant reagent biotinylates the lysine residues of external proteins (Volz et al., 1995). After four washings, PM and microsomal proteins were prepared and diluted to 0.2 mg/ml in a 1% Nonidet P-40, 0.1% BSA lysis buffer (Volz et al., 1995). One milliliter was incubated with the anti-CYP1A1/2 antibody (5 μg) or the anti-CPR serum (10 μl) for 2 h at room temperature. Ten micrograms of protein A-Sepharose CL-4B (Pharmacia, Freiburg, Germany) was added and the mixture was rotated overnight at 4°C. Beads were pelleted, washed six times, resuspended in 100 μl of 5% SDS, 20% glycerol, 10% mercaptoethanol, 0.025% pyronin Y, and 1.5 M Tris/HCl buffer, pH 6.8, and heated at 95°C for 3 min. Aliquots were loaded on SDS-9% polyacrylamide gels. Biotinylated proteins were revealed by peroxidase-conjugated streptavidine followed by enhanced chemiluminescence detection. 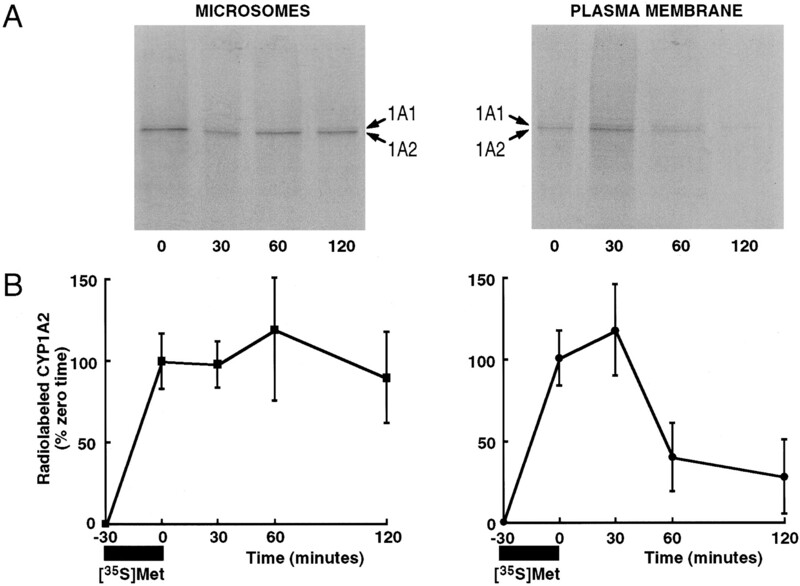 Other blots were revealed by the anti-CPR or anti-1A1/2 antibody. For immunoinhibition, hepatocytes from 3-methylcholanthrene-treated rats were incubated for 30 min at 4°C with the anti-CYP1A1/2, anti-CYP1A1, or anti-CPR antibody, or with nonimmune rabbit immunoglobulins or a nonimmune goat serum. After five washes, PMs were prepared, and NADPH (1 mM)-supported, CYPs1A-mediated ethoxy-resorufinO-deethylase (EROD) activity was measured as reported (Tinel et al., 1995). Isolated or cultured hepatocytes were pulse-labeled for 30 min with [35S]methionine (10 μCi/106 cells), washed twice, and chased with 300 μg/ml methionine. At various times, hepatocytes were removed and PM and microsomes were prepared. CYPs1A were immunoprecipitated with the anti-CYP1A1/2 antibody and underwent electrophoresis, as described above. Gels were dried and exposed to hyperfilm βMax (Amersham, Saclay, France) for 3 weeks. Differences between means were assessed by ANOVA followed by a Student's t test or a Dunnett's test. Specificity of Antibodies and Presence of CYPs1A in PM Immunoblots. The anti-CYP1A1 antibody only recognized CYP1A1, whereas the anti-CYP1A1/2 antibody recognized CYP1A1 and CYP1A2 but no other proteins (Figs. 1 and 2). The antibodies did not react with the N-terminal CYP1A peptides bound to albumin (Fig. 1). CYPs1A were detected in the PM, without upper bands that would suggest glycosylation (Fig.2). Untreated rats expressed CYP1A2 but little CYP1A1. 3-Methylcholanthrene and isosafrole induced CYP1A1 and CYP1A2 in microsomes and PM, but the CYP1A1/CYP1A2 ratio in PM was only half that in microsomes (Table 1). CoCl2, which inhibits ferrochelatase and holoenzyme formation and causes proteolysis of CYP apoproteins (Sinclair et al., 1982) decreased microsomal CYPs1A, whereas PM CYPs1A were nonsignificantly decreased (Fig. 2). Specificity of antibodies for CYP1A2 and/or CYP1A1 without recognition of N-terminal CYP peptides. SDS-9% polyacrylamide gels were loaded with purified CYP1A1 (2 pmol), CYP1A2-expressing yeast microsomes (about 2 pmol of CYP1A2), and 10 μg of the N-terminal, premembrane peptides of CYP1A1 and CYP1A2 conjugated to BSA. Gels were developed, transferred to nitrocellulose sheets, and revealed with Coomassie blue, anti-1A1 antibody (2.5 μg/ml) or anti-1A1/2 antibody (1 μg/ml). Lanes 1, CYP1A2-expressing yeast microsomes; lanes 2, albumin-conjugated N-terminal peptide of CYP1A2; lanes 3, albumin-conjugated N-terminal peptide of CYP1A1; lanes 4, CYP1A1. Effects of various treatments on the recognition of microsomal and PM CYPs1A by the anti-CYP1A/2 antibody. Hepatocytes were isolated from UT, untreated rats; 3-MC, 3-methylcholanthrene-treated rats; ISO, isosafrole-treated rats; CoCl2, CoCl2-treated rats. Microsomes (Mic) and PM (Mb) were prepared. SDS-9% polyacrylamide gels were loaded with purified rat CYP1A1 (2 pmol), rat CYP1A2-expressing yeast microsomes (about 2 pmol of CYP1A2), 5 μg of microsomal proteins, and 10 μg of PM proteins. After transfer to nitrocellulose, blots were developed with the anti-CYP1A1/2 antibody (1 μg/ml). Dihydralazine has been shown to induce microsomal CYPs1A, but PM CYPs were not studied (Bourdi et al., 1992). In this study, dihydralazine administration increased CYP1A1 and CYP1A2 in PM immunoblots (Fig.3). In flow cytometry experiments performed with the anti-CYP1A1/2 antibody, specific fluorescence (mean ± S.E. for three experiments) was 1.26 ± 0.08 fluorescence units in untreated rats versus 2.09 ± 0.13* in dihydralazine-treated rats. With the anti-CYP1A1 antibody, specific fluorescence was 0.12 ± 0.03 in untreated rats versus 0.76 ± 0.09* in treated rats (*P < .05). Immunoblot of microsomal and PM proteins from three untreated rats (UT) and three dihydralazine-treated rats (DHZ). SDS-9% polyacrylamide gels were loaded with 10 μg of microsomal proteins (Mic) and 20 μg of PM proteins (Mb). Immunoblots were performed with the anti-CYP1A1/2 antibody (1 μg/ml). 1A1, CYP1A1; 1A2, CYP1A2. When expressed as the percentage (mean ± S.E.) of that in microsomes from untreated rats, CYP1A2 was 100 ± 35 in Mic/UT, 120 ± 11 in Mic/DHZ, 31 ± 4 in Mb/UT, and 65 ± 13* in Mb/DHZ (*P < .05). Also expressed as the percentage of CYP1A2 in microsomes from untreated rats, CYP1A1 was 0 in Mic/UT, 116 ± 9 in mic/DHZ, 0 in Mb/UT, and 43 ± 4 in Mb/DHZ. Specificity of Antibodies and Vesicular Transport in Flow Cytometry Experiments. Because flow cytometry may involve the recognition of conformational epitopes, we assessed the specificity of the antibodies with this technique (Fig. 4). The anti-CYP1A1 antibody weakly recognized the PM of untreated rats, which weakly express CYP1A1, but better recognized the PM of 3-methylcholanthrene- and isosafrole-treated rats, which highly express CYP1A1. 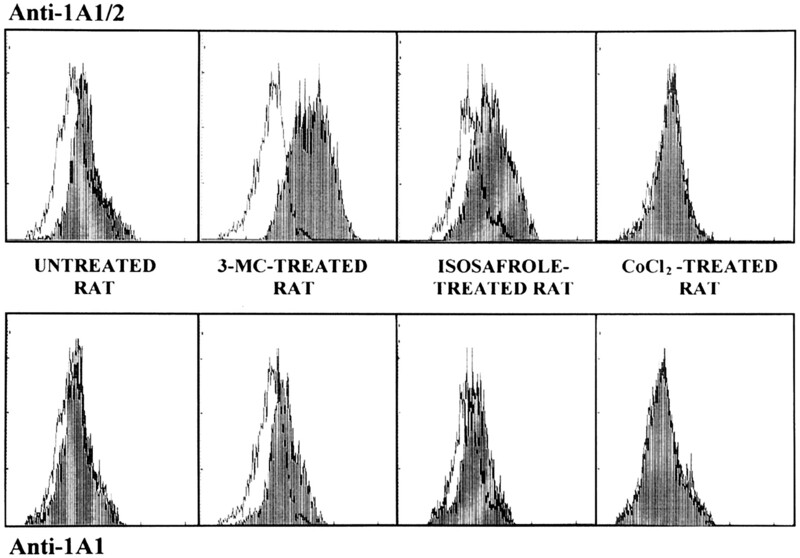 The anti-CYP1A1/2 antibody did not recognize the PM of CoCl2-treated rats, recognized the PM of untreated rats (expressing CYP1A2), and strongly recognized the PM of 3-methylcholanthrene- or isosafrole-treated rats, which highly express CYPs1A. Flow cytometry assessment of PM CYPs1A in isolated hepatocytes from untreated, 3-methylcholanthrene-, isosafrole-, or CoCl2-treated rats. Hepatocytes were exposed to nonimmune rabbit immunoglobulins (1 μg/100 μl), the anti-CYP1A1/2 antibody (1 μg/100 μl), or the anti-CYP1A1 antibody (2.5 μg/100 μl), and then to FITC-labeled anti-rabbit immunoglobulins. Dead cells stained with propidium iodide were excluded. The histograms show the number of cells (arithmetic scale on the ordinate) with a given fluorescence (log scale on the abscissa). The white and black histograms correspond to hepatocytes exposed to nonimmune immunoglobulins and the anti-CYP antibody, respectively. The difference in relative linear fluorescence intensity derived from the logarithmic mean channel number in these histograms represents an index of the specific labeling of PM proteins. With the anti-CYP1A1/2 antibody, this difference (mean ± S.E. for four experiments, each in triplicate) was 1.26 ± 0.08 fluorescence units in untreated rats and 6.20 ± 0.30*, 2.83 ± 0.12*, and 0.15 ± 0.12* in 3-methylcholanthrene-, isosafrole-, and CoCl2-treated rats, respectively. With the anti-CYP1A1 antibody, this difference was 0.10 ± 0.03 in untreated rats, and 1.62 ± 0.17*, 0.37 ± 0.17, and 0.05 ± 0.04 in 3-methylcholanthrene-, isosafrole-, and CoCl2-treated rats, respectively (*P < .05 compared with untreated rats). To assess the vesicular transport of CYPs1A, hepatocytes were cultured for 3 h with or without transport inhibitors, and PM CYPs1A were studied by flow cytometry (Table 2). CYP1A2 was studied with the anti-CYP1A1/2 antibody in hepatocytes from untreated rats, which mostly express CYP1A2. CYP1A1 was studied with the selective anti-CYP1A1 antibody in hepatocytes from 3-methylcholanthrene-treated rats, which express both CYP1A1 and CYP1A2. Cycloheximide, caffeine at 20°C, brefeldin A, colchicine, and vinblastine decreased PM CYPs1A, whereas lumicholchicine, an inactive analog of colchicine, had no effect (Table 2). Interestingly, similar effects were observed in vivo. PM CYPs1A also were decreased 5 h after colchicine administration (Fig. 5). In vivo effect of colchicine on PM CYPs1A. Hepatocytes were isolated from untreated rats or rats treated with colchicine (2.5 mg/kg) 5 h before sacrifice. Flow cytometry experiments were performed with the anti-CYP1A1/2 antibody. Specific fluorescence (mean ± S.E. 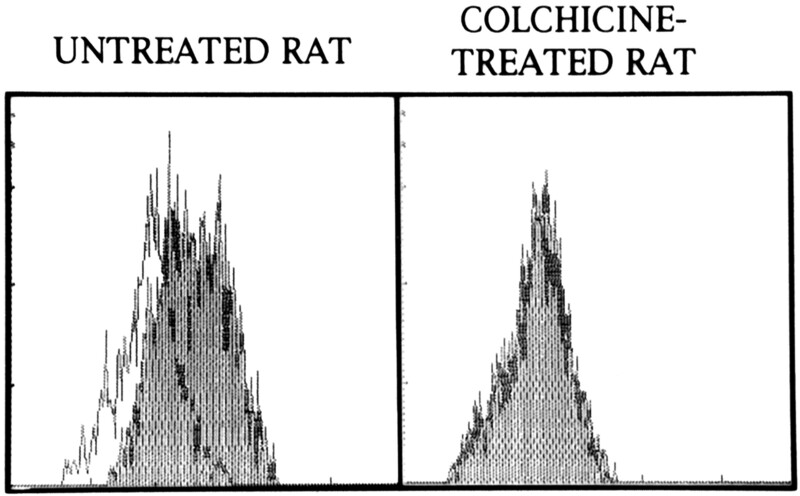 for three rats, each analyzed in triplicate) was 1.27 ± 0.09 fluorescence units in untreated rats and 0.16 ± 0.04* in colchicine-treated rats (*P < .01). [35S]Methionine was incorporated into microsomal and PM CYP1A2 (Fig. 6). In contrast, CYP1A1 was weakly labeled, although both CYP1A1 and CYP1A2 have eight methionines (Nelson and Strobel, 1988) and although CYP1A1 is as abundant as CYP1A2 in 3-methylcholanthrene-treated rat microsomes (Table 1). This reduced incorporation suggests that CYP1A1 has a lower synthesis rate. The radioactivity of microsomal CYP1A2 was stable for the 2 h of the experiment in isolated hepatocytes (Fig. 6) and exhibited a half-life of about 10 h in cultured rat hepatocytes (data not shown). In contrast, the radioactivity of PM CYP1A2 was maximum 0 to 30 min after the chase and then disappeared with a half-life of less than 30 min. Although the weak labeling of CYP1A1 precluded densitometric quantitation, CYP1A1 radioactivity also appeared to be stable in microsomes and short-lived in PM (Fig. 6). Pulse chase labeling of microsomal and PM CYPs1A. Isolated hepatocytes from 3-methylcholanthrene-treated rats were labeled with [35S]methionine (10 μCi/106cells) for 30 min and chased with methionine (300 μg/ml). At various times, cells were removed and PM and microsomes were prepared. Microsomal or PM proteins (0.2 mg) were immunoprecipitated with the anti-CYP1A/2 antibody (5 μg), and 50 μl of the final supernatant was loaded on SDS-9% polyacrylamide gels. After electrophoresis, gels were dried and autoradiographed. A, autoradiogram of [35S]methionine-labeled CYPs1A: CYP1A2 is markedly labeled by [35S]methionine, whereas CYP1A1 is very weakly labeled. B, densitometric quantitation. Pulse chase labeling and immunoprecipitation with the anti-CYP1A1/2 were performed seven times, and the [35S]methionine-labeled CYP 1A2 band was quantitated (mean ± S.E.). Due to weak labeling, the CYP1A1 band was not quantitated. 1A1, CYP1A1; 1A2, CYP1A2. Presence of CYPs1A and CPR on PM Surface. Recognition of CYPs by flow cytometry, excluding permeabilized cells, suggested that CYPs1A are, at least in part, located on the outside of the PM. This was confirmed by confocal microscopy that showed CYPs1A and CPR on the PM (Fig. 7). Finally, hepatocytes from 3-methylcholanthrene-treated rats were incubated with a membrane-impermeant biotinylating agent, and PMs were prepared (Fig.8). After immunoprecipitation with the anti-CYP1A1/2 antibody, four biotinylated proteins were recovered. The two lower proteins (around 50 kDa) comigrated with CYP1A1 and CYP1A2. The intermediate protein (around 63 kDa) was nonspecifically recognized by all antibodies (anti-1A1/2, anti-CPR, or anti-immunoglobulins alone). The upper protein had a molecular mass of 75 kDa and was revealed by the anti-CPR antibody, indicating that CPR, which tightly associates with CYPs, was coprecipitated by the anti-CYP1A1/2 antibody. To confirm the presence of CPR on the PM, PMs from biotinylated hepatocytes were immunoprecipitated with the anti-CPR antibody (Fig.8). The streptavidin-peroxidase stain showed the 75 kDa of biotinylated CPR and a thick 50-kDa band probably including diverse CYPs. Indeed, the anti-CYP1A1/2 antibody showed two bands around 50 kDa, above the major Ig bands detected by the secondary antibody alone. Because isolated hepatocytes always contain damaged cells allowing the entry of the biotinylating agent, we also prepared microsomes and immunoprecipitated them with the anti-CYP1A1/2 antibody. Biotinylated CYPs1A and CPR were detected in undiluted microsomes, but not after a 1:100 dilution reproducing the microsomal contamination of the PM fraction (Fig. 8). Confocal scanning microscopy of PM CYPs1A and CPR. Isolated hepatocytes were prepared from 3-methylcholanthrene-treated rats, exposed to diverse immunoglobulins, fixed, and analyzed by confocal scanning microscopy. A, hepatocytes exposed to nonimmune rabbit immunoglobulins (1 μg/100 μl) and FITC-labeled anti-rabbit immunoglobulins. B, hepatocytes exposed to the anti-CYP1A1/2 antibody (1 μg/100 μl) and FITC-anti-rabbit immunoglobulins. C, hepatocytes exposed to nonimmune goat serum (2 μl/100 μl) and FITC-anti-goat immunoglobulins. D, hepatocytes exposed to the anti-CPR serum (2 μl/100 μl) and FITC-anti-goat immunoglobulins. Cell surface biotinylation of CYPs1A and CPR. Hepatocytes from 3-methylcholanthrene-treated rats were exposed to a membrane-impermeant biotinylating agent, washed, and used to prepare PM and microsomes. Microsomal or PM proteins (0.2 mg) were immunoprecipitated with 5 μg of the anti-CYP1A1/2 antibody or 10 μl of the anti-CPR serum. SDS-9% polyacrylamide gels were loaded with aliquots of the supernatants (10 μl), Amersham Rainbow colored protein molecular mass markers (2.5 μl), in vitro biotinylated CYP1A1 (2 pmol), or in vitro biotinylated CYP1A2-expressing yeast microsomes (about 2 pmol of CYP1A2). Nitrocellulose sheets were incubated either with peroxidase-conjugated streptavidin (diluted 1:4000) or with the anti-CYP1A1/2 antibody (1 μg/ml) followed by peroxidase-conjugated anti-rabbit immunoglobulins. Other blots were revealed with the anti-CPR serum (diluted 1:2500) followed by anti-goat immunoglobulins, or with the anti-1A1/2 antibody (1 μg/ml) followed by anti-rabbit immunoglobulins, or were only exposed to the anti-Ig. Lanes 1 to 7, streptavidin/peroxidase (revealing biotin). Lanes 1 and 2, in vitro biotinylated, purified CYP1A1 and CYP1A2-expressing microsomes, respectively. Lanes 3 to 7, proteins immunoprecipitated with the anti-1A1/2 antibody; lane 3, PM from nonbiotinylated hepatocytes; lane 4, PM from biotinylated hepatocytes; lane 5, undiluted microsomes from nonbiotinylated hepatocytes; lane 6, undiluted microsomes from biotinylated hepatocytes; lane 7, same diluted 1:100 (to reproduce the microsomal contamination of the PM fraction). Lanes 8 and 9, PM from nonbiotinylated hepatocytes immunoprecipitated with the anti-1A1/2 antibody and revealed with the anti-CPR serum (lane 8) or only anti-goat immunoglobulins (lane 9). Lanes 10 to 12, PM immunoprecipitated with the anti-CPR antibody; lane 10, biotinylated hepatocytes, revelation with streptavidin; lane 11, nonbiotinylated hepatocytes, revelation with anti-1A1/2; lane 12, nonbiotinylated hepatocytes, anti-goat Ig only. 1A1, CYP1A1; 1A2, CYP1A2. Hepatocytes were exposed to either nonimmune immunoglobulins or the anti-CYP or anti-CPR antibody before PM preparation and EROD activity measurement (Table 3). The anti-CYP1A1/2 antibody inhibited EROD activity by 96%, suggesting that CYPs1A are mostly located on the outside of the PM. The anti-CYP1A1 antibody caused 26% inhibition (Table 3), as expected from the proportion of this CYP in the PM of 3-methylcholanthrene-treated rats (Table 1). The anti-CPR antibody only caused 33% inhibition (Table 3). However, whereas the anti-CYP1A1/2 antibody inhibited EROD activity by 95% in isolated microsomes (data not shown), the anti-CPR antibody only caused 45% inhibition (data not shown), suggesting that this antibody has only incomplete immunoinhibitory potency. In this study, we used antibodies specific for CYP1A1, and both CYP1A1 and CYP1A2, respectively (Figs. 1 and 2) to study the transport of CYPs1A to the PM. This study clearly shows that CYPs1A follow vesicular flow to the PM. Indeed, inhibitors acting at various steps of the vesicular transport process all decreased PM CYPs1A in vitro (Table2). PM expression was decreased by cycloheximide (Table 2), which interrupts CYP synthesis, or by caffeine at 20°C, which blocks vesicular flow between the ER and Golgi (Jäntti and Kuismanen, 1993). PM CYPs also were decreased by brefeldin A, which interrupts transport from a fused ER/Golgi pool (Miller et al., 1992) and by vinblastine or colchicine (Table 2), which interrupt the flow of post-Golgi transport vesicles along microtubules (Hastie, 1991; Hamel, 1992). Interestingly, colchicine also decreased PM CYPs1A in vivo (Fig.5), showing that this vesicular transport occurs in vivo. Pulse chase experiments with [35S]methionine showed, for the first time, that only the newly synthesized CYP molecules are transferred to the PM (Fig. 6). Although ER CYP1A2 was stably radiolabeled for several hours, in contrast, radiolabeled CYP1A2 reached the PM with a half-life of less than 30 min, and then disappeared from the PM with a half-life of less than 30 min. Further studies are required to determine whether this quick disappearance is due to endocytosis or to some other mechanism. Whatever the mechanism, this quick disappearance indicates that previously labeled ER CYP molecules are not transported to the PM. Thus, only the newly synthesized CYP molecules reach the PM. Contrasting with marked CYP1A2 labeling, CYP1A1 was poorly labeled by [35S]methionine both in the ER and in the PM (Fig. 6), although both CYP1A1 and CYP1A2 have eight methionines (Nelson and Strobel, 1988) and although CYP1A1 is as abundant as CYP1A2 in 3-methylcholanthrene-treated rat liver microsomes (Table 1). This reduced [35S]methionine incorporation suggests that CYP1A1 has a lower synthesis rate than CYP1A2. Because only the newly synthesized CYP molecules reach the PM and because the synthesis rate of CYP1A1 is less than that of CYP1A2, a lesser number of CYP1A1 molecules than CYP1A2 molecules should be transported to the PM. Indeed, the CYP1A1/CYP1A2 ratio in the PM was only half that in microsomes (Table 1). This study also conclusively shows that PM CYPs1A are located on the outside of the PM. This was demonstrated by flow cytometry, confocal microscopy and, for the first time, by biotinylation experiments (Figs.4, 7, and 8). Furthermore, exposure of whole cells to the anti-CYP1A1/2 antibody at 4°C, before five washes, PM preparation, and EROD determination indicated that CYPs1A are mostly located on the outside of the PM. Indeed, EROD activity was mostly inhibited (Table 3), although in this type of experiment, the antibody can only react with the CYP molecules that are located on the cell surface. The reason why CYPs are located on the outside of the PM is incompletely understood. CYPs are located on the cytosolic side of the ER membrane and their vesicular migration to the PM should normally lead to a CYP protein also located on the cytosolic side of the PM. To explain the presence of CYPs on the outside of the PM, two main hypotheses have been discussed. A first hypothesis is that CYPs could achieve a dual topology across the ER membrane during their synthesis in the ER (Robin et al., 1996). The major cytosolic form would be retained in the ER, whereas a hypothetical, minor luminal form would not be retained and would follow quick vesicular fow to the outside of the PM (Robin et al., 1996). This could explain the rapid migration of a fraction of newly synthesized CYP molecules to the PM, as demonstrated in this study. However, despite functionalN-glycosylation sites (Sczesna-Skorupa and Kemper, 1989;Loeper et al., 1998), PM CYPs are apparently not glycosylated (Loeper et al., 1998), suggesting that these CYPs may not achieve an endoluminal topology in the ER/Golgi compartments, where glycosylation takes place (Rudd and Dwek, 1997). Therefore, a second hypothesis is that CYPs could secondarily acquire an inverted transmembrane topology, either in post-Golgi transport vesicles, or in the PM itself (Loeper et al., 1998). However, it is not totally excluded that a minor endoluminal form of CYPs might be present and glycosylated in the ER but then partly deglycosylated in subsequent compartments of the vesicular transport system. Further studies are required to assess these (and other) hypotheses. Whatever the mechanism, the presence of CYPs on the external surface of hepatocytes may have pathological consequences. Dihydralazine is transformed by CYP1A2 into reactive radicals that covalently modify CYP1A2 (Bourdi et al., 1994). This modification may trigger an autoimmune reaction and the appearance of anti-CYP1A2 autoantibodies (Robin et al., 1997). Dihydralazine has been shown to induce microsomal CYPs1A, but PM CYPs were not studied (Bourdi et al., 1992). In this study we show that dihydralazine administration increased CYPs1A in PM immunoblots (Fig. 3) and flow cytometry experiments (underResults). The anti-CYP1A2 autoantibodies may therefore participate in the immunological destruction of hepatocytes because CYP1A2 is present on the PM and is further increased by dihydralazine administration. Thus, dihydralazine may both trigger the autoimmune reaction (Robin et al., 1997) and increase its PM target (this study). A previous study showed the presence of CPR in the PM of transformed COS cells (Amarneh and Simpson, 1996). In this study, we demonstrate that CPR is also present on the surface of hepatocytes, as shown by confocal microscopy, biotinylation, and immunoinhibition experiments (Figs. 7 and 8; Table 3). Furthermore, coprecipitation experiments showed that PM CPR is closely associated with PM CYPs (Fig. 8). The presence of the reductase in the PM and its close association with CYPs explain why PM CYPs do support NADPH-dependent monooxygenase activities in vitro (Table 3). In conclusion, this study shows for the first time that 1) CYPs1A follow vesicular flow to the PM in vitro and in vivo, 2) only the recently synthesized CYPs1A molecules are transported to the PM, 3) PM CYPs1A are mainly located on the outside of the PM, 4) CPR is also present on the external surface of hepatocytes (explaining why PM CYPs can support monooxygenase activities), and 5) dihydralazine administration increases PM CYP1A2 (its autoimmune target). We thank Philippe Beaune (Institut National de la Santé et de la Recherche Médicale U490, Paris, France) and Denis Pompon (Centre de Génétique Moléculaire du Centre National de la Recherche Scientifique, Gif-sur-Yvette, France) for the gift of purified rat CYP1A1 and rat CYP1A2-expressing yeast microsomes. ↵1 This study was supported in part by the Bioavenir Institut National de la Santé et de la Recherche Médicale /Rhone Poulenc Rorer program (contract no. 95133) and the European Union BIOMED 2 program (contract BMH4-CT96- 0658). (1996) Detection of aromatase cytochrome P450, 17α-hydroxylase cytochrome P450 and NADPH:P450 reductase on the surface of cells in which they are expressed. Mol Cell Endocrinol 119:69–74. (1987) Human anti-endoplasmic reticulum autoantibodies appearing in a drug-induced hepatitis are directed against a human liver cytochrome P-450 that hydroxylates the drug. Proc Natl Acad Sci USA 84:551–555. (1994) Membrane topology of liver microsomal cytochrome P450 2B4 determined via monoclonal antibodies directed to the halt transfer signal. Biochemistry 33:6945–6951. (1996) Human cytochrome P450 2E1 is a major autoantigen associated with halothane hepatitis. Chem Res Toxicol 9:1159–1166. (1992) Anti-liver microsomes autoantibodies and dihydralazine-induced hepatitis: Specificity of autoantibodies and inductive capacity of the drug. Mol Pharmacol 42:280–285. (1990) Anti-liver endoplasmic reticulum autoantibodies are directed against human liver cytochrome P-450 IA2. A specific marker of dihydralazine-induced hepatitis. J Clin Invest 85:1967–1973. (1994) Interactions of dihydralazine with cytochromes P4501A: A possible explanation for the appearance of anti-P4501A2 autoantibodies. Mol Pharmacol 45:1287–1295. (1987) Determination of the membrane topology of the phenobarbital-inducible rat liver cytochrome P-450 isoenzyme PB-4 using site-specific antibodies. J Cell Biol 104:209–219. (1996) Cytochrome P4502E1 is a cell surface autoantigen in halothane hepatitis. Mol Pharmacol 50:573–582. (1992) Natural products which interact with tubulin in the vinca domain: Maytansine, rhizoxin, phomopsin A, dolastatins 10 and 15 and halichondrin B. Pharmacol Ther 55:31–51. (1991) Interactions of colchicine with tubulin. Pharmacol Ther 51:377–401. (1993) Effect of caffeine and reduced temperature (20°C) on the organization of the pre-Golgi and the Golgi stack membranes. J Cell Biol 120:1321–1335. (1998) Membrane topology of NADPH-cytochrome P450 reductase on the endoplasmic reticulum. Arch Biochem Biophys 351:175–179. (1993) Cytochromes P-450 on human hepatocyte plasma membrane. Recognition by several autoantibodies. Gastroenterology 104:203–216. 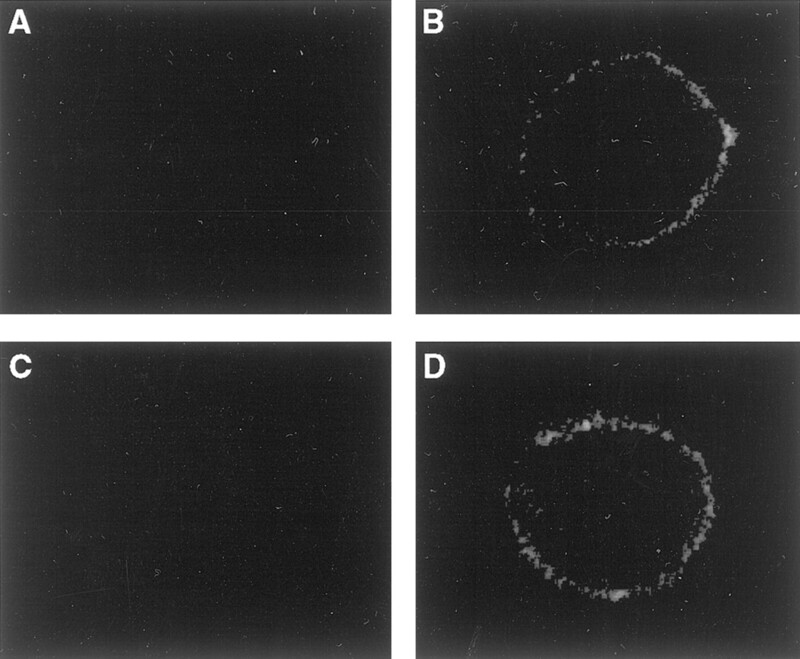 (1990) Presence of functional cytochrome P-450 on isolated rat hepatocyte plasma membrane. Hepatology 11:850–858. (1998) Topology inversion of CYP2D6 in the endoplasmic reticulum is not required for plasma membrane transport. Mol Pharmacol 53:408–414. (1989) Major antigen of liver kidney microsomal autoantibodies in idiopathic autoimmune hepatitis is cytochrome P450db1. J Clin Invest 83:1066–1072. (1992) Post-Golgi membrane traffic: Brefeldin A inhibits export from distal Golgi compartments to the cell surface but not recycling. J Cell Biol 118:267–283. (1988) On the membrane topology of vertebrate cytochrome P-450 proteins. J Biol Chem 263:6038–6050. (1996) Enzyme-specific transport of rat liver cytochrome P450 to the Golgi apparatus. Arch Biochem Biophys 333:459–465. (1997) Plasma membrane cytochromes P450 as neoantigens and autoimmune targets in drug-induced hepatitis. J Hepatol 26 (Suppl 1) 23–30. (1996) Antigenic targets in tienilic acid hepatitis. Both cytochrome P450 2C11 and 2C11-tienilic acid adducts are transported to the plasma membrane of rat hepatocytes and recognized by human sera. J Clin Invest 98:1471–1480. (1995) Cytochrome P4502B follows a vesicular route to the plasma membrane in cultured rat hepatocytes. Gastroenterology 108:1110–1123. (1997) Glycosylation: Heterogeneity and the 3D structure of proteins. Crit Rev Biochem Mol Biol 32:1–100. (1987) A short amino-terminal segment of microsomal cytochrome P-450 functions both as an insertion signal and a stop-transfer sequence. EMBO J 6:2425–2431. (1987) An immunochemical approach to investigating the mechanism of halothane-induced hepatotoxicity. Prog Drug Metab 10:187–205. (1989) NH2-terminal substitutions of basic amino acids induce translocation across the microsomal membrane and glycosylation of rabbit cytochrome P450IIC2. J Cell Biol 108:1237–1243. (1982) Decrease in hepatic cytochrome P-450 by cobalt. Evidence for a role of cobalt protoporphyrin. Biochem J 204:103–109. (1995) The interleukin-2 receptor down-regulates the expression of cytochrome P450 in cultured rat hepatocytes. Gastroenterology 109:1589–1599. (1991) Localization of the N-terminal methionine of rat liver cytochrome P-450 in the lumen of the endoplasmic reticulum. Biochim Biophys Acta 1063:235–241. (1995) Selective reentry of recycling cell surface glycoprotein to the biosynthetic pathway in human hepatocarcinoma HepG2 cells. J Cell Biol 130:537–551.